What is the therapy approach to a limited stretchability above a distal interphalangeal joint? Is it always possible to shorten the extensor tendon? What needs to happen in the event that the proximal interphalangeal joint shows signs of a sever mobility dysfunction after the removal of a stax finger splint? What are the options in case of a remaining motion dysfunction in the proximal interphalangeal joint? Which surgical measure is appropriate in cases of strongly deformed distal interphalangeal joints and poorly healed extensor tendon ruptures? The rigidification achieved through the application of two to three small wires (K-wires). What needs to be done in the event of a non-healed extensor tendon rupture above the distal interphalangeal joint? It is important to emphasize at this point that the final result of an extensor tendon rupture can only be evaluated many months later (approximately after six months!). Nevertheless there are isolated cases which take a bad turn after conservative treatment. 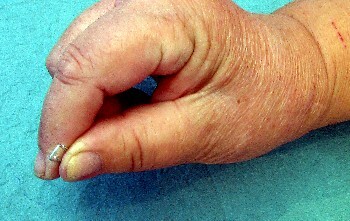 The image shows a permanent loss of stretchability at the distal phalanx of the thumb. This loss of stretchability is particularly impeding because it concerns the thumb. A surgical approach is highly recommendable in this case. The insufficient stretchabilityof twenty-five degrees or more. 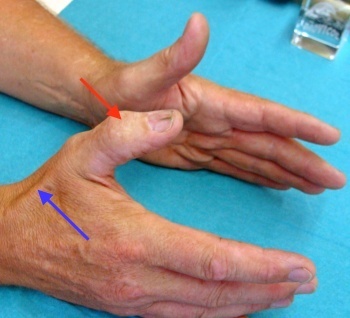 The limited mobility of the proximal interphalangeal joint. One of the things that can be done in this situation is to shorten the extensor tendon. The reason for a limited stretchability above the distal interphalangeal joint in most cases is that no scar at all or a very unsatisfactory scar that tends to be too long formed between the ends of the extensor tendon. The latter would cause the extensor tendon to be too long, therefore impeding the lifting function to the joint. If one now cuts out the scarred tissue from the extensor tendon and re-stitches the tendon up, there is a good chance that the tendon will grow back together. This procedure however is very complex, because it requires the immobilization through a rigid wire (K-wire) of the distal interphalangeal joint which then has to be removed again six to seven weeks later. Even if this intervention sounds simple it should only be performed by a surgeon who disposes of sufficient experience in the area of tendon hand surgery. No, this procedure should not be applied if the joint already shows signs of wear-and-tear. Osteoarthritic wear-and-tear on distal interphalangeal joints is also referred to as Heberden osteoarthritis. A combination of Heberden osteoarthritis and an extensor tendon rupture is a very unfavorable situation. Due to the osteoarthritis the extensor tendon may already be damaged. In this case the extensor tendon will mostly like not heal properly even if adequately immobilized in a stax finger splint. The best possible approach to a ruptured extensor tendon in such case is to perform surgery, in fact, a very similar procedure to the one performed on Heberden osteoarthritis – a fusion of the bone ends of the joint with the help of a screw or wires. In the case of Heberden osteoarthritis this is the only safe procedure which will lead to an acceptable positon of the distal interphalangeal joint while at the same time providing pain relief. Even in this case it is not necessary to immediately resort to a surgical approach! First of all the patient should take up individual motion exercises. One of the most proven methods here is to bend and stretch the hand in a lukewarm hand bath five to six times a day for five minutes each. Once the patient notices progress he/she may reduce the number of training sessions to three to four times. Physiotherapy may be an additional valuable option. Under no circumstances the exercises should be geared towards improving the motion of the proximal interphalangeal joint by applying pressure onto the distal interphalangeal joint of the finger (for example by pressing onto the finger nail). The result of such an approach could very easily be that the freshly healed-up extensor tendon is placed under tension provoking a decrease in stretching efficiency in the distal interphalangeal joint. It is of utmost importance to avoid the aforementioned, regardless whether a patient chooses individual motion exercises or physiotherapy. In cases of severe functional impediment of the proximal interphalangeal joint mobility, a tenolysis should be considered. However, this option should only be selected after several months of unsuccessful exercise efforts. This surgery aims at releasing clotted tendons in the area of the proximal interphalangeal joint from adhesion, allowing an unhindered sliding motion. This procedure too is very sensitive and should only be practiced by an experienced hand surgeon. In these cases the arthrodesis is the method of choice, meaning the rigidification of the distal interphalangeal joint. Please don´t be alarmed: A rigidification of the distal interphalangeal joint does not mean that the finger will remain rigid! The procedure will retain the uncompromised mobility of the metacarpophalangeal as well as the proximal interphalangeal joint. Merely the isolated bendability of the distal interphalangeal joint will be omitted through this procedure. The image shows that even an object as small as a paper clip can be easily picked up with a rigid distal interphalangeal joint.